There’s nothing quite like falling in love. It makes even the rainiest, rottenest day feel like one long cinematic moment. We can hardly think of anything else. We’re haunted, almost, by the sweet, clinging ghost-mist of it. Like a euphoric dream that leaves a pleasant residue on our waking brain. I’m talking, of course, about falling madly for new music. We hear it that first time and we’ve just got to know, What is this? We track it down, then play it over and over again, every chance we get. And when we’re away from it, it echoes through our mind. Eventually that new shine wears off and the music becomes familiar, but by then it’s a part of us. It’s woven into our fiber, tapped out like Morse code on strands of our DNA. Certain albums become soundtracks for periods in our lives. We listen to them later and we’re instantly transported back in time. I’ve fallen for new music hundreds of times. Admittedly, though, it happens a lot less often now than it did when I was in my teens and twenties. Maybe this is why so many of us become caricatures of the decades in which we attended high school and college. It takes a certain discipline to stay tuned-in to pop culture throughout adulthood and not look like a joke, and most of us don’t have that kind of time. When I was a teen in the ’80s, I remember how comical those ‘60s throwbacks looked to me, ambling through the mall in bell bottoms and hippie tie-dyed t-shirts while the rest of us rocked mullets and wrapped studded belts around our suede booties. Bundschu and his partner Rognlien are the founders of Vindie Wine out of California. 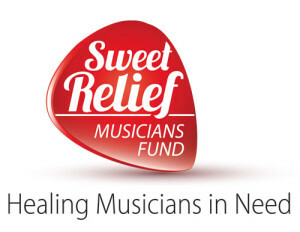 These guys have come up with a great way for wine lovers to discover and fall in love with new music. 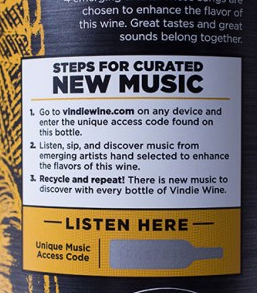 Here’s how it works: when you buy a bottle of Vindie wine, you’ll find a scratch-off code on the back of the label. Pick up your favorite device and follow the instructions on the bottle to Vindie’s website. There, you’ll enter your code and be given immediate access to a carefully curated list of eight songs by four emerging artists which have been chosen specifically to enhance the wine you’ve purchased. And listen — this isn’t just some rinky-dink bonus music Vindie is throwing at you to say thanks for buying their wine. This is some well thought-out stuff. People can get 15% more pleasure out of their wines? It would seem there’s really something to this “magic” of which Rognlien speaks. In an article published online by Decanter in January 2016, Hannah Seaton reported that, “A study has shown that people can get 15% more pleasure out of their wines by simultaneously drinking and listening to the right kind of music.” The study, led by Charles Spence, a professor in experimental psychology at Oxford University, matched tastes such as sweet and sour to sound properties like pitch and tempo. “Sound can…entirely change the taste and texture of the wine,” writes Seaton. For example, she shares that sweet wines like Riesling match well with music that has an even rhythm, slow tempo, and a high but soft pitch, like piano music. Meanwhile, Italian reds pair with syncopated rhythm, fast tempo and a high pitch. Vindie is expanding into Whole Foods and other specialty retailers, so ask your favorite shop to carry it. In the meantime, you can purchase online at www.VindieWine.com. If you’d like Vindie to bring a music and wine tasting event to your neighborhood, let them know through their website. Bright appearance, with present/full aromas of butter, chocolate and blackberry. A medium/full-bodied red. The finish is layered. Supple tannins add weight and a polished texture and lead to a bright, lush finish. An overall good Red Blend Blend from California, United States.